Popular historic sites such as Fremantle Prison and The Bell Tower are in your itinerary. Get some cultural insight at The Perth Mint and Pandemonium Estate. Explore Perth's surroundings by going to Caversham Wildlife Park (in Whiteman), Dolphin & Whale Watching (in Mandurah) and Rockingham (Palm Beach, Point Peron, & more). Dedicate the 7th (Thu) to wine at some of the top wineries in the area. On the 24th (Thu), give your taste buds a day to remember with a local gastronomic tour. The adventure continues: enjoy the sand and surf at Cottesloe Beach, tour the pleasant surroundings at Scarborough Beach, appreciate the history behind Kings Park War Memorial, and explore the activities along Swan River. 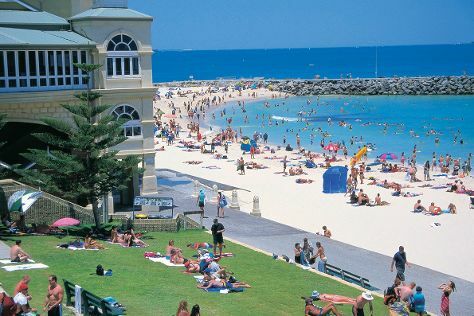 Take the guesswork out of planning a Perth vacation by using our trip itinerary maker. If you are flying in from Malaysia, the closest major airport is Perth International Airport. In October, plan for daily highs up to 28°C, and evening lows to 12°C. Wrap up your sightseeing on the 9th (Sat) early enough to travel back home.